It’s New Years. Time for fresh starts and new beginnings. Spirits are high and we’re wiping our slates clean of the past. 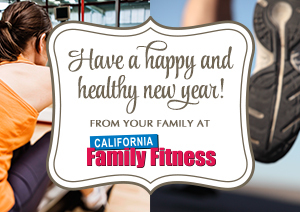 This is THE year to conquer your fitness goals! Whatever you decide to do more or less of, make them attainable. Your resolutions do not have to be big “pie-in-the-sky” dreams. In fact, making goals that you’ll be able to accomplish will keep your motivation soaring all year long because you will be able to see the progress you’ve made! Instead of saying “I want to live healthier this year” be specific about your goals like “I want to run in my first marathon”, or “I want to bike ride 40 miles a week”. Starting with the basics, who/what/when/where/why/how will help you narrow down your broader goals. In fact, being specific gives you a clear sense of where you’re headed and you’re more likely to, not only stick with your resolutions, but succeed at them too. Similar to being specific about your goals, you should be able to measure, or track your progress. Using measurements like hours, miles, or pounds are a good place to start. If your New Year’s resolution includes intangible things like “laugh more, love myself more, be a better parent/friend” it might help to journal your thoughts throughout the month to notate times when you’re doing these things. That way you're able to see your successes and be proactive about looking for more ways to make the most of every moment. Knowing your limitations and resources is a vital aspect of creating SMART goals. If you know you cannot commit to going to the gym more than 4 times a week, than don’t make your New Year’s resolution “Go to the gym everyday”. You’ll only set yourself up for failure if you are not realistic in your goal planning. Give yourself a deadline to help increase your motivation and decrease the likelihood of slacking off as time goes by. If you have an overall goal for the year such as “Run in my first marathon”, set monthly goals, or quarterly goals to keep you going strong such as “Run 3 miles without stopping by March”. This is YOUR year to be whoever you want to be. Dig deep and you may be surprised at the strength you discover on the inside and live your life with a Carpe Diem outlook!